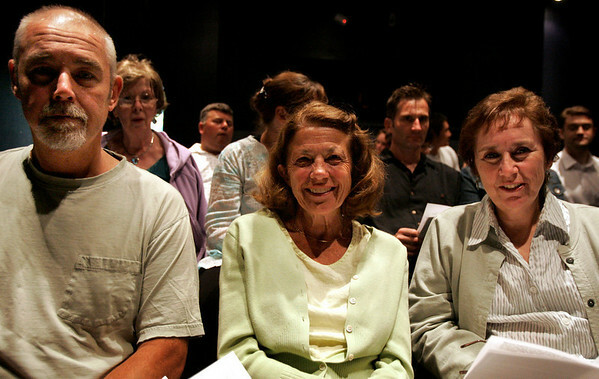 Salem: Richard Buchanen, left, and his wife Susan sat in the second row with Pat Cardenas during the Quiet Coyote Theater Company's presentation of "An Evening of One-Acts" featuring three one-act plays on Friday. Photo by Mary Catherine Adams/Salem News. , Salem: Richard Buchanen, left, and his wife Susan sat in the second row with Pat Cardenas during the Quiet Coyote Theater Company's presentation of "An Evening of One-Acts" featuring three one-act plays on Friday. Photo by Mary Catherine Adams/Salem News.